Discussion in 'Xbox 360' started by ImaGonnaGetYou, Jun 18, 2009 with 27 replies and 10,014 views. Wrote this up earlier today, but IBM apparently didn't want it, so I'll post it here. 2. 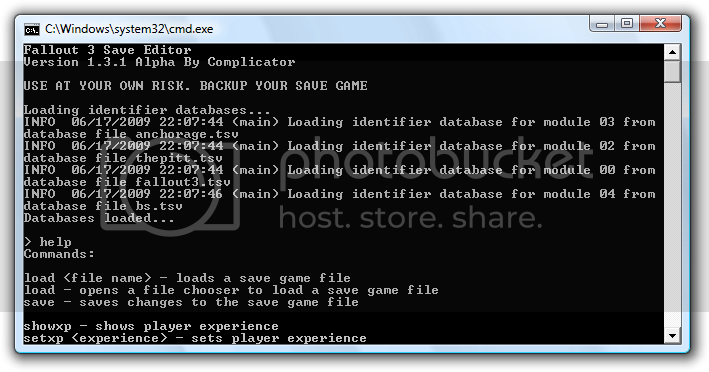 Extract your save to the desired directory, and make a backup incase you screw up. 3. Open FOedit, and wait for the program's files to load, then enter "load", and enter the directory of the file you extracted. 4. First, enter "listinv". 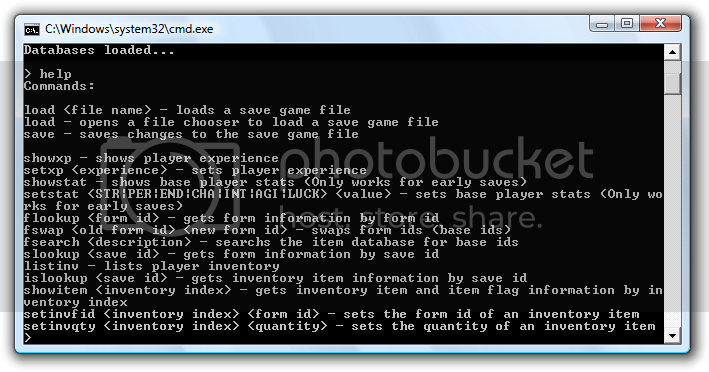 This will list your entire inventory, including quest items and such. 1. To change the amount of an item you have, such as, say, Winterized T-51b Power Armor, find it on the inventory list. Remember the number of that item on the list. Now, enter "setinvqty (The number the item is located on on the list) (the quantity of that item you want)". For example, if the T-51b is in slot number 54, and I wanted 9 instead of 1, I'd enter "setinvqty 54 9". 2. If you want to swap out an item with another item, enter "setinvfid (The number the item is located on on the list) (The 8-number ID of the item you want the first item swapped for)". For example, if I wanted to swap T-51b with another item, I'd enter "setinvfid 54 00000000" (With the 0's being the ID of the desired item). 3. Do not create thousands upon thousands of heavy items such as Miniguns, Missile launchers, etc., since the game will be in a permanent state of lag. 1. Simply enter "setexp" and change your experience value to whatever you want. If you haven't loaded Broken Steel on your save yet, it will only max out at 20 until you load it. 1. Enter "help", and more commands will show up. With this, you can also edit your stats. 1. Enter "save", wait a few seconds, then close the program, rehash, resign, and you're done. 2. Drop the edited file back into the Fallout 3 save folder, and have fun with your mod. I would recommend getting the Mysterious Stranger's .44 Magnum, since it does OVER 9000 damage, literally. Visit the Fallout 3 Wiki and search for the item you want, and the information box on the right of the page will show its ID. Credit goes to Complicator from Game-Tuts for making the app. This is great. Thanks for posting this! I can't w8 till I can actually get tinkering with this. Can someone tell me how to get the Mysterious Strangers Magnum? What do I replace it with, what is the 8 character code? hey i unpacked the zip file and put it all the files in a new folder on my desktop. when i try to open the .bat file it just immediatley closes. if i have user controls or whatever do you have to run as admin for it to wrok or something? "@java -Dlog4j.configuration=file:./log4j.xml -Xms128M -Xmx512M -jar fo3edit.jar"
You can also do this with modio.. or at least most of it. But anyway just for those who cant seem to get the other mod to work. Last time I checked, Modio could only change your name and replace base IDs. This can give you info on your inventory and change your Stats. This program is much better. They had a CoD section until modded warfare shut down. They didn't wanted to get punished... But yeh this site is mainly for glitching and online modding. Someone finally made this huh? This is the program I sent you silly. Really? Wow, I totally forgot. Can create new item inventory???:? Cannot sorry must item replace. terrible english!